Madison (Wisconsin): Brown & Carpenter, Printers, 1853. Very Good. First edition. Octavo. Stitched wrappers. 22pp. Owner name on the front wrap ("O.F. Bartlett"), a small chip and a little foxing on the front wrap, a very good or better copy. 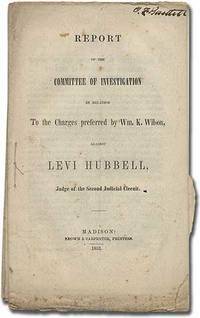 Charges in the case against Hubbell, Wisconsin Supreme Court Justice (1848-1853) and Chief Justice (1851) who was the only Wisconsin judge to face an impeachment trial. In the highly publicized trial, Hubbell was accused of accepting bribes and hearing cases in circuit court in which he had financial interests. Although Hubbell was acquitted, he resigned from the Court. Scarce. OCLC locates a single copy (Wisconsin Historical Society).